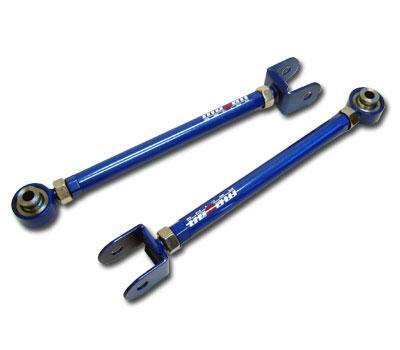 Megan Racing has developed reinforced and adjustable Traction Arms to accommodate the needs of the aggressive and performance oriented tuner. Being constructed of a Lightweight Steel-Alloy which is able to withstand the stresses of extreme competition, these arms are powdercoated with a 3-Stage process to ensure durability and protection against the elements. These Traction Arms allow for fine-tuned adjustments to the rear suspension geometry. By changing the length of the traction rod you change the position and pitch of which the suspension rotates upon and you change the amount of “Anti-Squat” of the rear. Although the adjustment is minimal, it can change the behavior or the vehicle during weight transfer.